I hate build-up that gathers around lids of finish. Pick any finish. 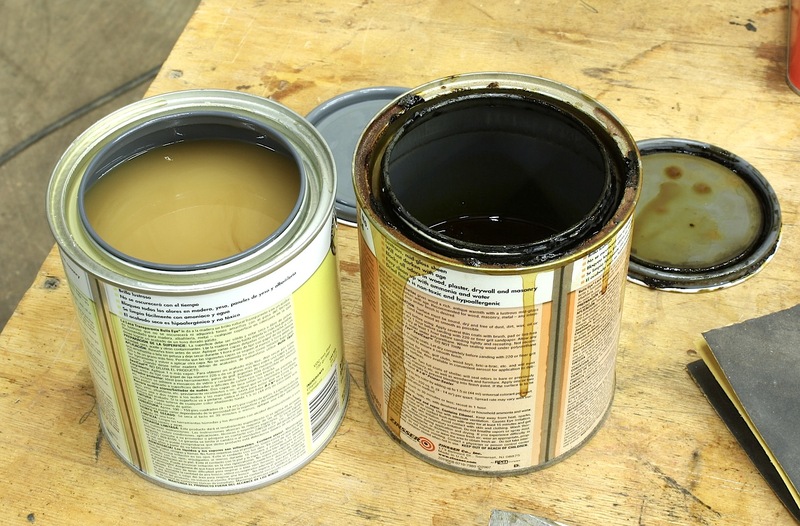 Whether it’s, paint, shellac, lacquer or something else, if you pour it from a can, sticky goo comes to visit. As you pry open the often-stuck lid, crap gets on your screwdriver or on your hands or gloves. Goo is easily transferred to your project and that’s worse than glue spots – OK, nothing is worse than glue spots. If you think all you have to do is use a brush to clean the rim as you put the can away, you’re wrong. Junk, partially dried to become sticky, remains in the rim valley. If it would simply dry, it would be good. That’s not the case. For years I suffered with gooey can rims, but no more. I discovered a secret. The secret is a #6 finish nail and a hammer. You could use a #8 finish nail, but there is no use dropping down to a #4 nail – a hole that small is not going to help. Take a nail then puncture about four holes per quart can, or five holes per gallon can directly through the valley formed at the rim. It’s easy. A couple taps with a hammer and you’re through. 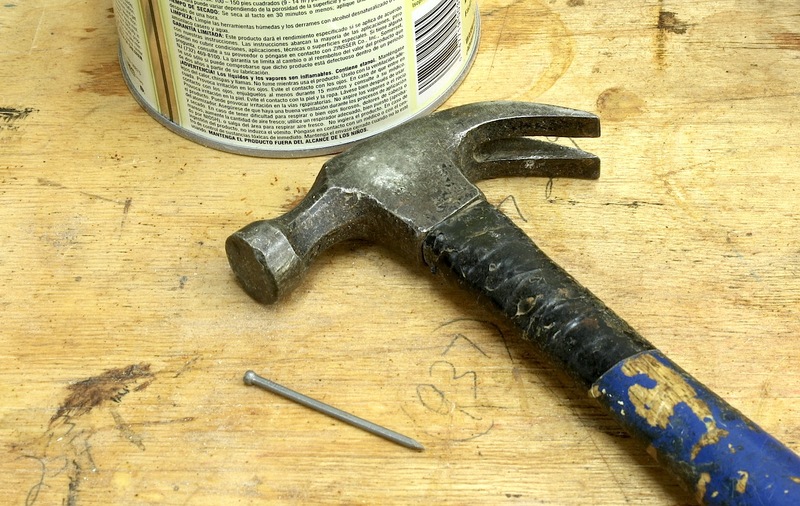 (You can use a big-boy hammer if you do not have one from a kids tool set like I do – remember these?) After you have your holes made, any product left in that valley seeps back into the can. Now you know why a #4 nail hole doesn’t do the job. It’s even better as you replace the lid. Any product left in the rim is then forced through your holes and not over the rim only to run down the can. You can only imagine the sounds made inside the can as you hammer the lid; a giant squishing noise as shellac spurts back into the can. With the lid in place, no air seeps into your can to ruin the product. It’s so clean. From October 12 – 14, 2012 I taught three different sessions at Woodworking in America – West Coast in Pasadena, California. Two of the same sessions were taught at Woodworking in America – Midwest some three weeks later from November 2 – 4. During my sessions, I played short video clips that emphasized various points I thought important. After the conferences, I received many emails asking that I post these video clips on my blog. If you attended one of my sessions during the conference, these videos make perfect sense. If, however, you did not attend my sessions, or even one of the conferences (Shame on you! ), some of these short clips might not be all that they could be. But I think you could still garner a nugget of useful information. If you have comments or questions about the techniques covered in these clips, as always, add a comment at the bottom of the page. I will respond ASAP. 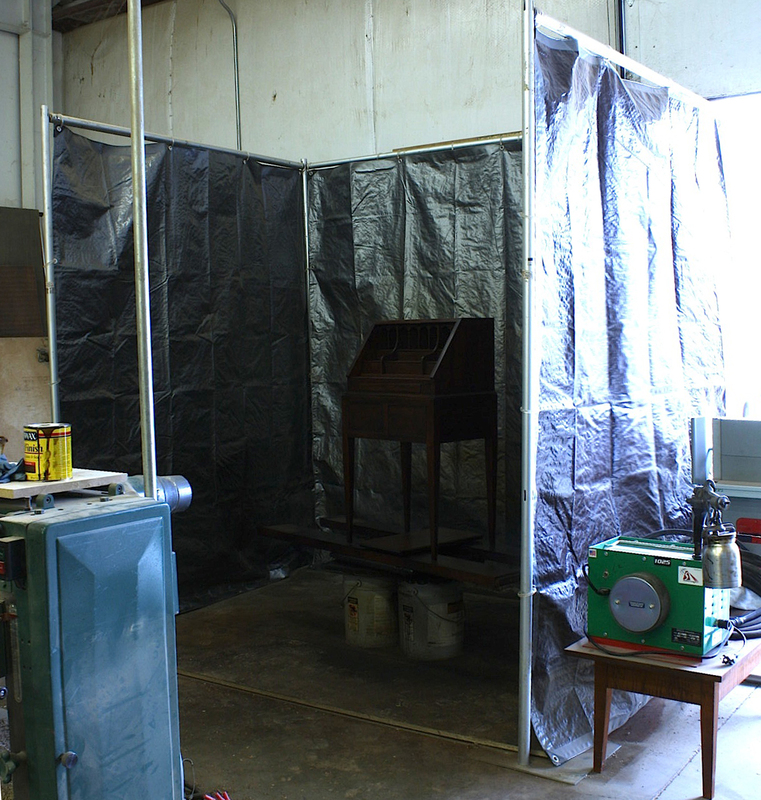 I’ve had a couple questions about my spray booth when it appeared in a couple blog posts a while back. Before I tell you about my booth, let me tell you how I sprayed in the past. 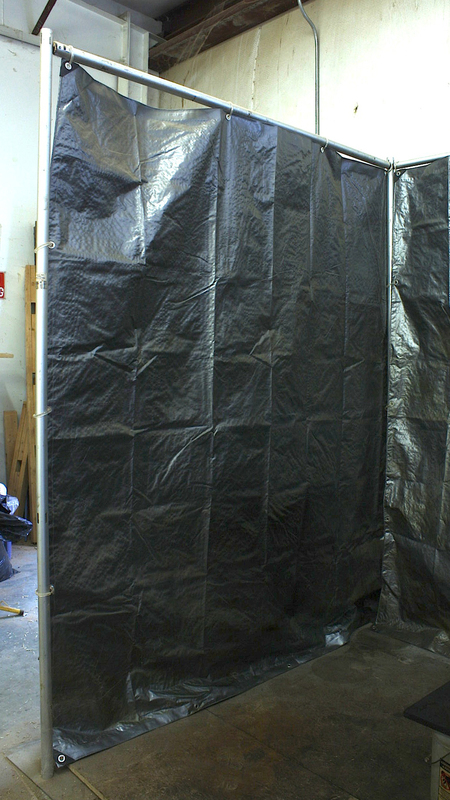 For a short time – about 11 months – I had an actual spray booth. Before that I confiscated a room, installed an overhead fan that was ducted nearly ten feet to an outside wall vent and called that my spray room. (The exhaust fan wasn’t much help.) And when I began woodworking in my two-car garage, I used a 20″ box fan – it wasn’t explosion proof, either – set in a window. Also, none of these so-called booths had an explosion proof light. No, I’m not flirting with danger, I just do not think all the safety crap is necessary. Today I have 1500 square feet to work in and my booth is a setup toward the front of my shop. (You can see it in the opening photo.) Still no explosion proof light, and no direct exhaust fan. What you do see is an old aluminum show booth to which I have packed the curtains away and hung inexpensive tarps to keep over-spray to a minimum. You can see light streaming in from the right-hand side of the booth. That is a larger overhead door that I can open or closed depending on the temperature and weather condition. I also have a 48″ drum fan to clear the shop of unwanted fumes – I’m in an industrial-type setting. If you’re interested in a booth like mine (who wouldn’t be) you can pick up the entire boot for around $217. You would need four 8′-0″ uprights ($15 each), four base plates at $64 and three adjustable drape supports that would run you $26 per support. The supports allow you to setup your booth between 6 feet and 10 feet wide. The same sizes are possible in depth. Three 8 x 10 tarps are maybe $15. Oh! I need to add in a set of shower curtain rings to hang the tarps. That pushes up the price a bit. Hey, it beats a cardboard box. At the beginning of August, I wrote about a #21 Combination Square. Read the blog here. In the blog, I included that I had purchased one of these squares and would share video sometime in the future. This is the future and below is the video. Enjoy. I don’t think there is any better teacher than experience. The only problem with experience is that it takes time. Lot’s of time. There are, however, ways to bypass that huge time drag and gain from experience quickly. You’re not necessarily getting experience, but you are learning from experience which is the next best option. How do you gain or learn from experience? You learn from those who have already paid their dues. This week I’m writing about Popular Woodworking Magazine’s Woodworking in America (WIA) conferences. At the bottom of this post is a short video that sums up my thoughts on the conferences, just what you stand to gain if you attend and why you should be there. Between here and there, I’ll briefly describe the sessions at WIA in which I share my experience. In “Finishes That Pop” – the title really says it all – I’ll discuss the steps needed to bring a great finish to your project. 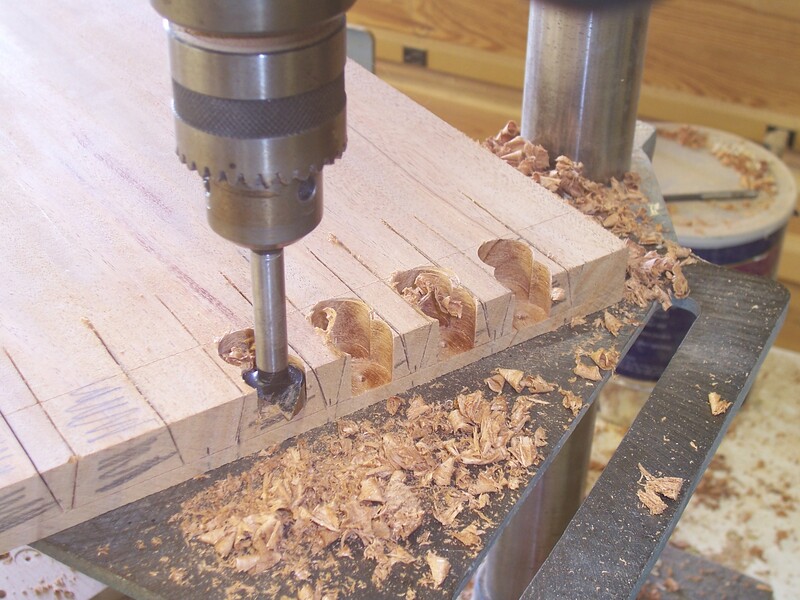 There are so many areas of woodworking in which small missteps add up to a major disaster. Finishing is at the top of that list. In more than twenty years of furniture construction, I have experienced more finish faux pas than one could expect. (I will never say I have seen it all because there is always something new around the corner.) As a result, I have picked up a number of finishing tips and tricks. 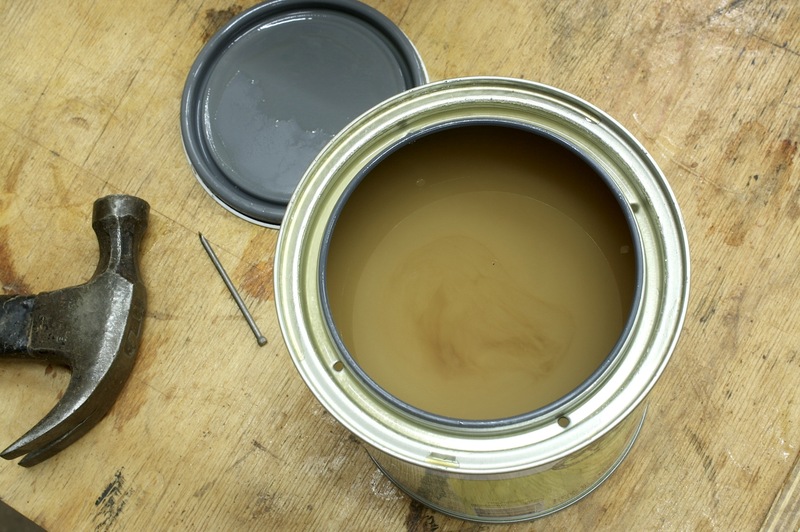 For example, did you know that there are times when you should final sand using #120-grit sandpaper, that wood coloration is best done with a good soaking instead of a controlled wipe or that on certain hardwoods applying a coat of oil is great while on others you are simply wasting your time? And just how many coats of oil/varnish does it take to build the right sheen? That’s just the beginning. In the sessions we’ll discuss much more. In the “The Mighty Dovetail” we’ll examine what has become the joint of all woodworking joints. Today, unlike centuries back, you are judged on how well you cut and fit this joint. That’s a shame because this joint has uses that do not – read that again, please – do not require you to spend huge amounts of time making exact cuts. In fact, After I walk through how to hand-cut this popular joint, I’ll share where you can take a few shortcuts, show to create this joint using a jigsaw and demonstrate how to speed up your process without jeopardizing a hand-cut look. Then we’ll spend time learning where, in building furniture, dovetails are a great choice and some areas to avoid altogether. If you are a dovetail devotee or newbie, this session will open your eyes. I have often said that if you know case construction (as in dovetails discussed above) and you can build a drawer and door, you have all the tools needed to produce any piece of furniture. 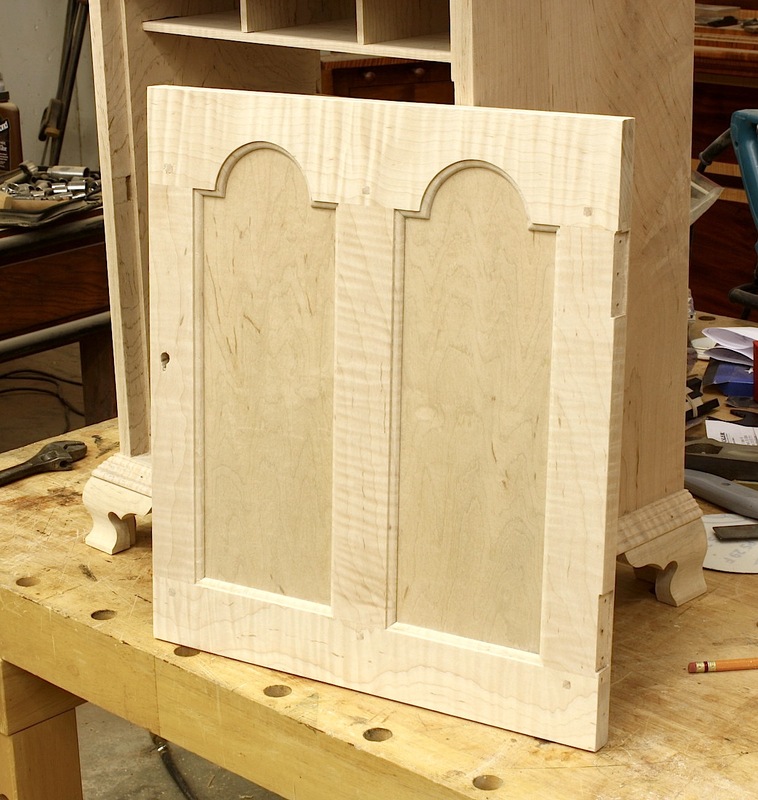 In “Doors: Types, Tips & Techniques” we’ll discuss all things door, including mortise-and-tenon joinery, mitered sticking and creating raised panels. I’ll share my techniques for producing door panels of all kinds, and the best angle to tilt your table saw to produce a perfect fit into a frame groove. I’ll even talk about hand planes and raised panels, too. In addition, I’ll share the technique and the story on why I learned to construct glass-door frames so they were rabbeted for glass right off the table saw – no more frame assembly then routing the rabbet. These are just my classes at Woodworking in America. There are so many other presenters that I know you’ll come away from these conferences a better woodworker. (Click here to register for a conference, or both conferences, or to read about other presenters and classes.) And as you’ll see in the video below, that is what this is all about. I hope to see you there. I use shellac on nearly every project that passes through my shop doors. I think it is the best product for furniture because it is easy to use, can be brushed on or sprayed, and dries quickly compared to urethane. I use shellac on top of aniline dye and even on top of a coat of boiled linseed oil if I aim to highlight figured grain. It is my “go to” finish before and after glaze. As you can tell, shellac is, in my opinion, the perfect topcoat. 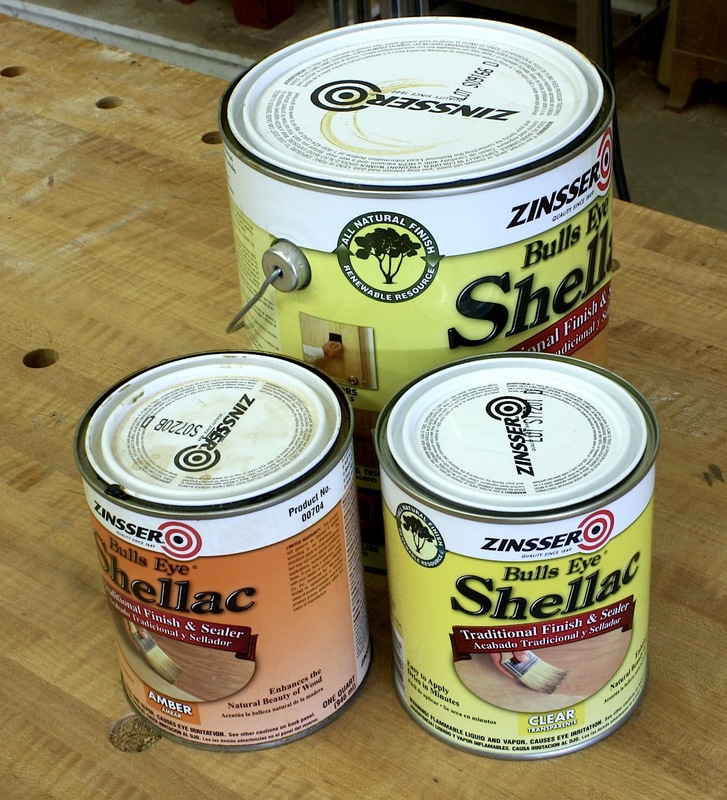 I’m good with shop-made shellac from flakes and I use store-bought shellac from Zinsser. 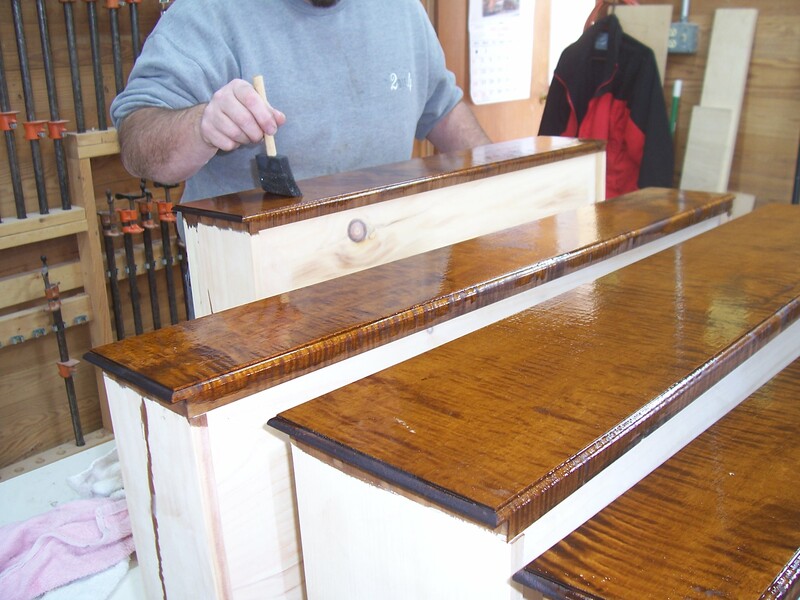 Until recently, my only problem with shellac – all shellac – is that I do not care for the high sheen that comes when shellac is built-up as a finish, but I have found a great work-around. I apply a coat of dull-rubbed effect lacquer, or I rub-out the surface using #0000 steel wool or an equivalent. 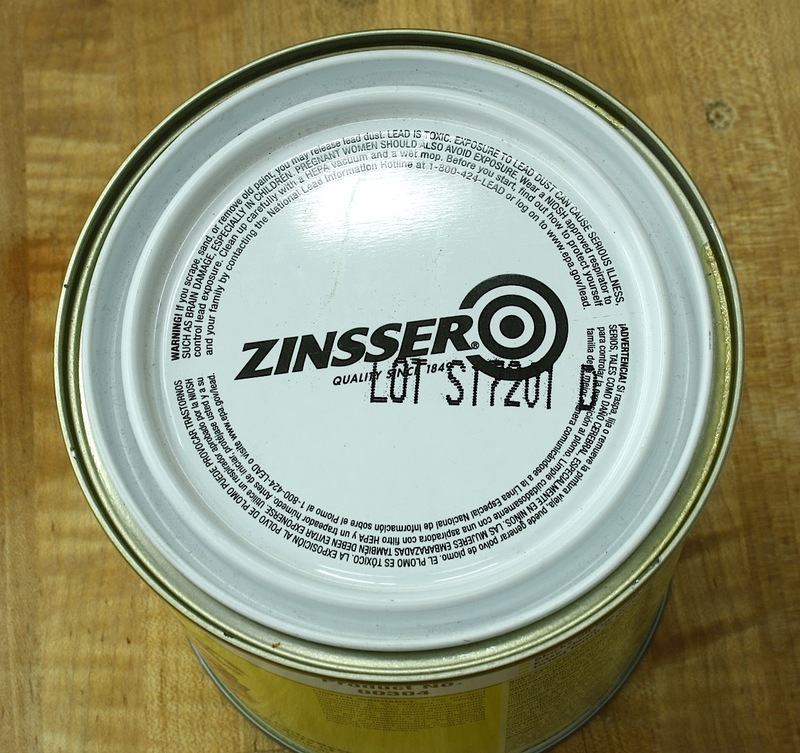 Over the last year or so, I have developed a second problem with Zinsser shellac purchased from hardware stores or the large home-center stores. As you undoubtedly know, shellac has a shelf-life. From the moment it is mixed into solution, it begins to degrade – degradation effects drying times. Eventually, as the degradation continues, you end up with a gummy mess with which to deal. Experience taught me this lesson, so I watch my dates closely. 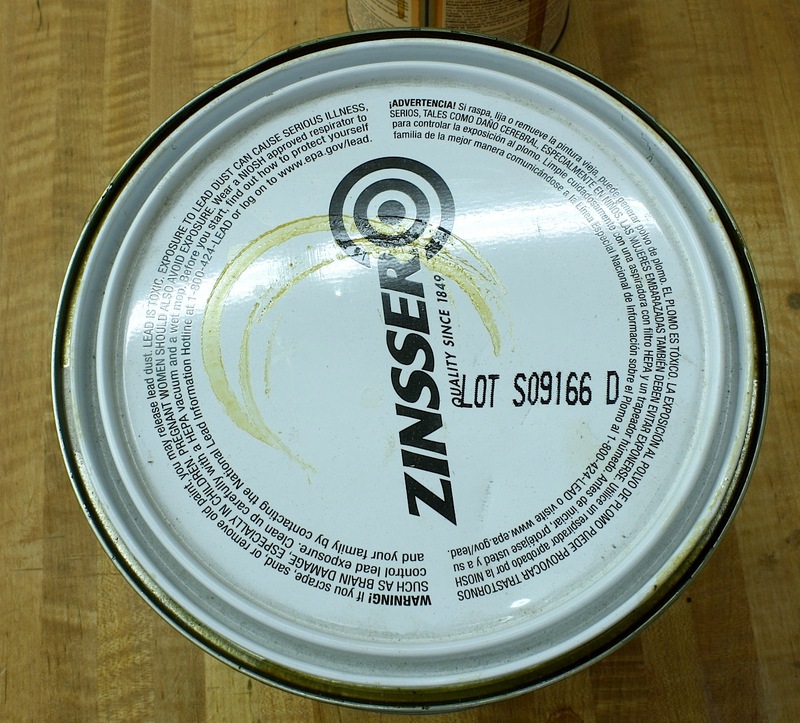 A while back, Zinsser switched from using a date stamp on can lids to a lot number. With the date stamp, and the fact that the company-issued literature states its shellac was good for three years after the stamped date, you had a good idea as to when the shellac would reach it’s end. Even today I can go into a local home-center store and find shellac in gallon cans with a date stamp of 2008 – in 2012, that can is not one I’ll purchase. With a lot number, there was no way to tell when the shellac was mixed. Or so I thought. I contacted the company, explained my dilemma and was pleasantly surprised when I received a reply that same afternoon. I now know how to read the lot number to tell when the shellac was mixed. Here is the information. The first number after the letter is the year the shellac was made. If you look at the number in the photo, you see a zero. That shows the year at 2010. The number one would represent 2011 and a two is for 2012. Easy enough. That’s probably all the information you need, but the company goes further. The first number after the year indicator stands for the month of mixture. In this case there is a seven, so this can of shellac was mixed in July. If the month would have been November you would see an “N”, December is a “D” and all other months are numbers. The two numbers printed after the month identifier are the exact day of the month on which the shellac was mixed. In our example that day would be 20. 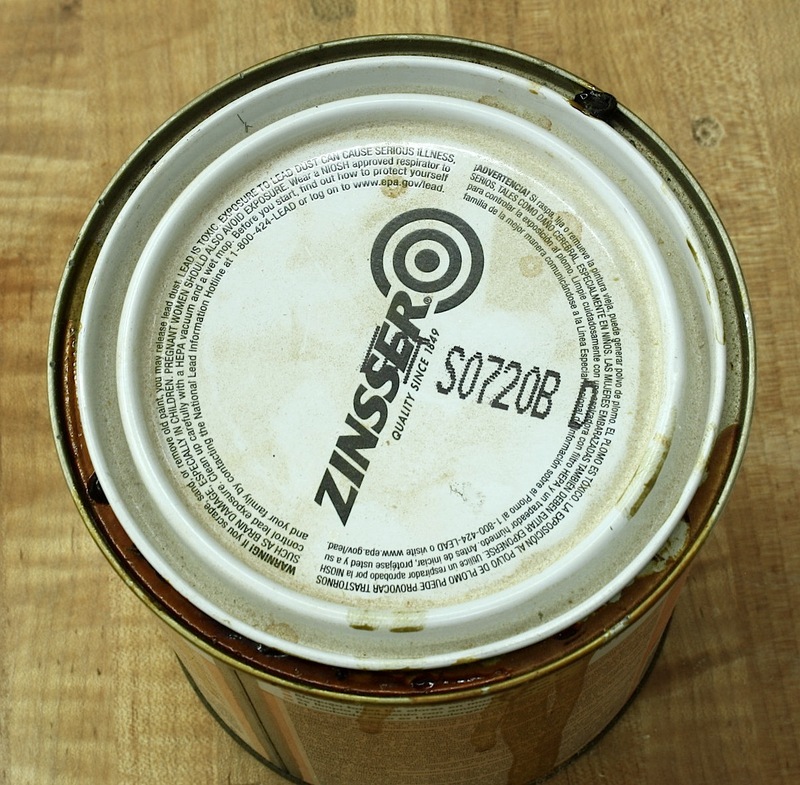 This can of shellac was manufactured on the 20th of July, 2010. With this information at hand, there is no reason to purchase shellac that is past or very close to the date of expiration put forth by the company. This also gives you the assurance that the shellac you buy is good to go. Below is another can lid for you to work out.